Primitive American Flag Vintage Bread Loaf Pan Light. Made using a vintage bread loaf pan. No two are the same. Unique lighting piece. 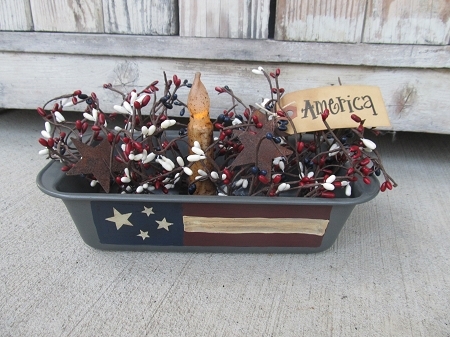 I've hand painted our flag on the front and filled the inside with Americana colored pip berries and rusty stars. Choice of 3" Electric Grubbied Candle Lamp with Silicone Bulb and On/Off switch OR a 4" Battery Operated Timer Candle. Average size is 10"x5". Hand painted, designed and signed by Heidi. Featured in the Country Sampler magazine July 2019 issue.